The world at your feet at a rock-bottom price. 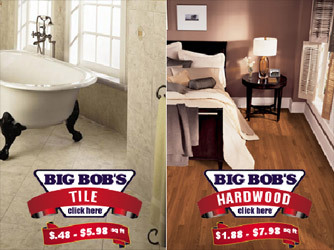 Since 1984, Big Bob’s has delivered Wichita unbeatable pricing to customers whose flooring needs demand broad choices. We carry the products you need to do the job: first-rate carpet, laminate, ceramic tile, and vinyl as well as value-lines of the same products. 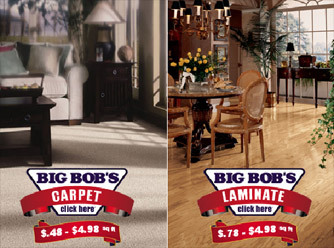 New flooring for a family room or remnants to remodel a rental property – Big Bob’s prices will fit your budget. And you can select from our huge in-stock selection, and take your purchase with you. Whatever the task at hand, Big Bob will answer. Honest-to-goodness good service, every day at Big Bob’s. Large selection of in-stock merchandise including Wichita's best selection of carpet, tile hardwood and laminate flooring. Bring Big Bob home. His products and services will make life beautiful. Products, price and service: Big Bob means the world to your floors.